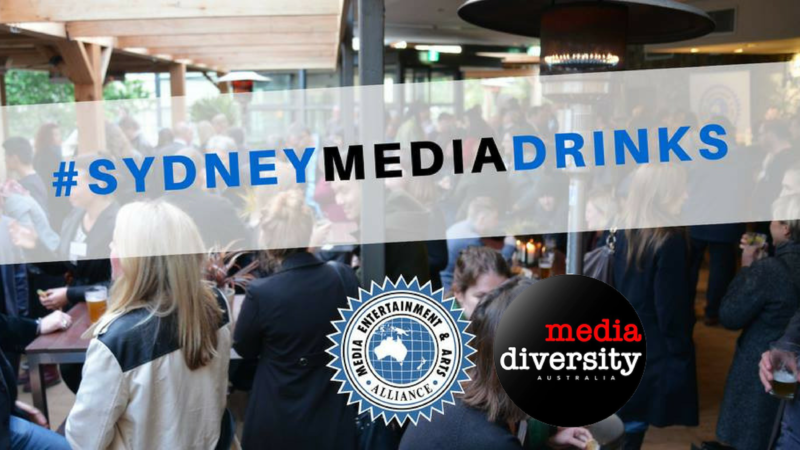 End of year Sydney Media Drinks, hosted by MEAA (Media, Entertainment and Arts Alliance) with Media Diversity Australia (MDA). Looking forward to seeing you all this Thursday, with special guest Marc Fennell from Media Diversity Australia. Marc is a radio and tv presenter, film critic, award-winning technology journalist and author of two books, he co-hosts SBS TV’s Walkley and Logie nominated current affairs programme ‘The Feed’ and also presents the media and tech series ‘Download This Show’ for ABC Radio. Join with your colleagues from across digital media – including the Guardian, 10Daily, news.com.au, Junkee, Buzzfeed, Pedestrian TV, Yahoo7 and from the digital teams of the SMH, Daily Telegraph, SBS, ABC, Channel9 and more – for a drink to finish the year off right. Catch the Q&A with 10Daily’s Josh Butler and MDA’s Marc Fennell, to talk about how digital journalists can improve our working lives and work together to make our news media more reflective of all Australians. Canapés provided, drinks at bar prices. MEAA members and non-members welcome, so don’t forget to invite your friends and colleagues.